Is our universe expanding or static? If it is expanding, is there sufficient mass to cause it all to collapse back in upon itself under gravity's influence? If the universe is static and not now expanding, is it stable? What holds it all together-if anything? These are questions gaining more attention these days as our knowledge data base in astronomy and astrophysics increases, and old theories are brought into question. There is much that can be said about these questions from the Biblical revelation. This passage teaches that Jesus was eternally existent with God the Father prior to the creation of "all things." There was a time when our material and spiritual universe did not exist. It had a definite beginning. But before that, God was. In fact, God is-because time itself was created by God. The Holy Spirit, in giving us this inspired passage of Scripture, explains that all things (both visible and invisible) in the entire universe were created through this same Jesus, the eternal Word. We may think of the universe and its intricate design as being conceived in the mind of the Father, then spoken into existence by the Son (who makes the invisible, visible). The Holy Spirit is the One who energizes and supplies life to the creation, not only at the time of creation but also moment by moment after that. We are also told that all things were created for Jesus. He is "the heir of all things." That means that we are house guests in Someone Else's universe! This implies a future accountability for all of us-history is headed somewhere-at the end of the road stands Jesus, to whom all power and authority has already been given (see John 5:22-29). The teaching of the New Testament is that now, at this very moment, there is a Man in heaven appearing in the presence of God for us. He is as certainly a man as was Adam or Moses or Paul; he is a man glorified, but his glorification did not de-humanize him. Today he is a real man, of the race of mankind, bearing our lineaments and dimensions, a visible and audible man, whom any other man would recognize instantly as one of us. But more than this, he is the heir of all things, Lord of all lords, head of the church, firstborn of the new creation. He is the way to God, the life of the believer, the hope of Israel, and the high priest of every true worshiper. He holds the keys of death and hell, and stands as advocate and surety for everyone who believes on him in truth. Salvation comes not by accepting the finished work, or deciding for Christ; it comes by believing on the Lord Jesus Christ, the whole, living, victorious Lord who, as God and man, fought our fight and won it, accepted our debt as his own and paid it, took our sins and died under them, and rose again to set us free. This is the true Christ; nothing less will do. One of the key words in the Colossians passage above ("...and in Christ all things hold together") is the Greek word sunistemi which means "to stand-together," "to be compacted together," "to cohere," "to be constituted with." This passage can be applied to the structure of the atom, for example. The nucleus of every atom is held together by what physicists call "weak" and "strong" forces. The nucleus of the atom contains positively charged and neutral particles-to use a simplistic model. Mutual electrostatic repulsion between the like-positive protons would drive the nucleus apart if it were not for the "strong force" which binds the nucleus together. Similarly, accelerated electrons circling the nucleus should quickly radiate all their energy away and fall into the nucleus unless there exists an invisible energy source to counteract this. But the day of the Lord will come like a thief, and then the heavens will pass away with a loud noise [rhoizedon, a rushing roar] and the elements [stoicheion, atoms] will be dissolved with fire and the earth and the works that are upon it will be burned up. 2 Peter 3:10 The Greek word translated "elements" in the above mentioned passage from Colossians (and in 2 Peter also) is stoicheion, which can mean "the building blocks of the universe," or "the ordered arrangement of things." It can also mean the "atomic elements." The word translated "dissolved" in 2 Peter 3:10 is literally (in Greek) luo, meaning "unloosed." This language suggests that there will come a time in the future when God lets go of the nuclear forces which hold the atom together. This passage, like the one in Colossians, strongly suggests that the active power of God is behind the mysterious strong force that holds every atomic nucleus together. If this is so, all the other fundamental forces of nature are likewise forces that originate with Christ and His sustaining direction of the old creation. Whatever we may think of God and physics, the Bible leaves us with no room to doubt that God does care about the sparrow that falls to the ground, the widow, the orphan, and the homeless. He does not lose track of His children and watches over them with infinite, patient, intimate Fatherly care. Not only does He sustain the universe by His mighty word of power, God also alters the status quo from time to time and, in response to prayer, frequently changes the course of entire nations. In a future day his intrusive reinterven-tion will be very radical indeed. Another important claim of Scripture about the old creation is that God is the present Sustainer of the universe. That is, He is not uninvolved, remote, detached and impersonal-leaving things to run by themselves by any means. Among secular scientists today there are many who acknowledge that God exists. But He is usually considered as only a First Cause-the One who brought the universe into existence and set it into motion. But most of these same scientists assume God was not involved after the initial act of creation. Here Jesus is called "the Alpha and Omega," "the First and the Last." Not only is Jesus the Son of God to be found at the beginning of history, He also stands at the end of history and at the end of every life. He is the Judge of all, and He is the heir of all things. Truth from science must in the long run agree with Biblical revelation-if the Bible is true. If the Bible "says what it means and means what it says" (to quote Chuck Missler) then it is Jesus who holds the universe in his hands just as the old American folk spiritual says. 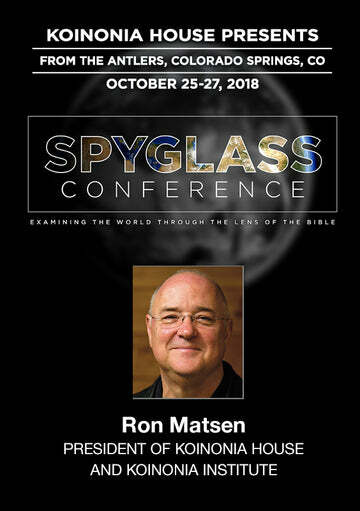 Next month, God willing, we'll look further at this subject in a discussion of theories of the vacuum, and the interaction between the material creation and the invisible, intangible (but very real) spiritual world which God has also created around us and within which the material world is embedded.